An international study has shown how to synthesize a new two-dimensional nano material with electrical and magnetic properties that could find uses in quantum computers and other electronics applications. Using redox-active organic molecules and magnetic metal ions as molecular building blocks, layered Chromium-Chloride-Pyrazine was developed with high electronic conductivity and magnetic order, which could be a precursor for 2D materials and herald a new generation of superconductors, catalysts, batteries, fuel cells and electronics. The team, led by Kasper Steen Pedersen of the Technical University of Denmark, whose work was published in Nature Chemistry [Pedersen et al. Nat. Chem. (2018) DOI: 10.1038/s41557-018-0107-7], contend that the 2D material should be viewed as a new type of chemistry where they are able to replace some of the building blocks in the material, allowing its physical and chemical properties to be altered. Such modification is not achievable with the most popular 2D material, graphene, for instance. In graphene, it is not possible to replace half of the carbon atoms with different kinds of atoms. However, in this method the team could design properties with a great deal more precision than in other 2D materials. 2D materials that are only one molecule thick can lead to different electrical properties from the same material in 3D. In the latter, electrons can move in any direction, while in a 2D material they have restricted horizontal movement as long as the wavelength of the electron is longer than the thickness of the 2D layer. 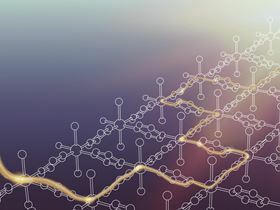 Many other 2D materials have been synthesized, some potentially viable for applications in quantum electronics, although they are all inorganic, while Chromium-Chloride-Pyrazine is an organic/inorganic hybrid material. However, while progress has been positive, it remains fundamental research, and there is still much to be achieved before production of such advanced 2D materials can be a reality. The team have also still to identify the degree of stability of the material in a range of applications – although underlying principles of the breakthrough remain relevant even if the material does prove unviable for some potential uses.